This is another typical early 1970’s cover. Note that both the title and the author are capitalized. This was pretty standard for MacDonald covers at the time. 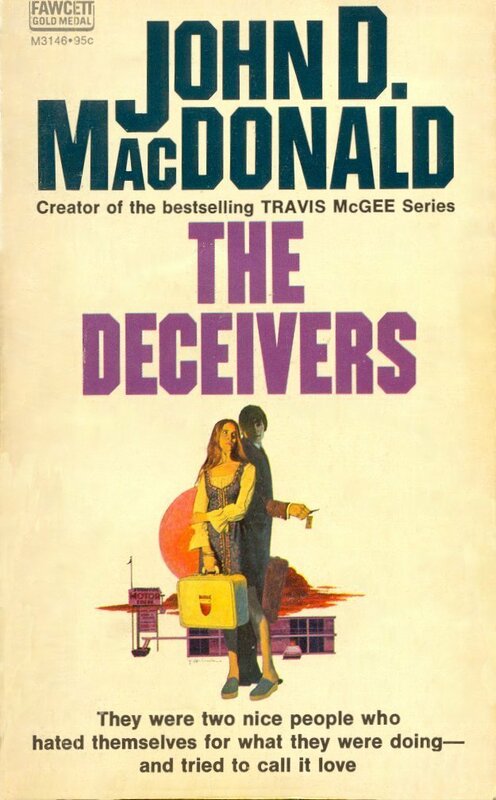 The pimping of the Travis McGee series ran from the mid 1960’s through about 1975. I don’t like this cover. Boooooorrrring! Let me see if I can recreate the thought process of the designer. “Ok, the story isn’t so great, so we’ll spice it up by having a couple on the cover just standing there. In case nobody gets it that they’re having an affair, we’ll add a motel. In case nobody realizes that it’s a motel, we’ll add a sign. Then a superfluous red cloud that looks cool but means nothing. And a beach ball sun. Oh yeah, a cop car.” Although I don’t know who painted the cover (there is a signature, but I can’t read it), I’m guessing it was Robert McGinnis. He did a lot of fairly tame JDM covers around this time and it looks to me like others that I know are his. Feel free to step up and correct me if I’m wrong! Update (05/14/2012): Thanks, Steve, for confirming that it is McGinnis. Now why did it take me seven months to update this post?